The roofing problem is: The roof to be replaced is on a townhome and has a slope on the same plane as another unit's roof that is not being replaced. The neighbor does not want any roofing work to be performed on his portion of the roof slope. If that is not enough of a problem there are two existing layers of roofing. 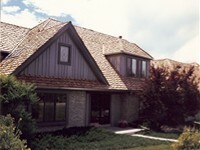 To install the new asphalt shingles requires the removal of the existing two layers of roofing. It also could be that the new roofing material is different than what is on the adjacent neighbor's roof with less or greater weather exposure. The roofing solution is: A Vertical Tie-in will need to be made disturbing the neighbor's portion of the roof as little as possible and to make a water tight intersection between the two different roofs located on the same slope. Below are two methods that could be considered. The Method "A" is the best method for joining different roofing materials on the same slope or plane such as asphalt shingles, wood shake, and tile, EPDM or any other roofing materials. This method utilizes a 2" x 2" (or larger) dimensional lumber, step flashing (pan and step flashing for tile), and metal cap flashing. Wood shakes require a minimum of two (2) pieces of 2" x 2" lumber stacked on top of each other. Tile roofs will require a minimum of three (3) pieces of 2" x 2" lumber stacked on top of each other. For Re-roofing simply cut the existing roof from the ridge to the eave separating the roofing material that is to stay in place from that which is to be removed. Try not to cut the existing base felt underlayment. Remove the existing roofing material from the portion of the slope where the new roofing material is to be installed. Install an 18" wide strip of ASTM Type II underlayment (30 pound base felt) from eave to ridge with half under the existing roofing material. Install a piece of lumber, described above, over the new 18" piece of base felt from the eave to the ridge. Then install the new underlayment and roofing material along one side of the 2" x 2" piece of lumber using new step flashing laced with each course as with any rake wall installation. Also install new step flashing into the existing roofing material along the other side of the 2" x 2" piece of lumber. 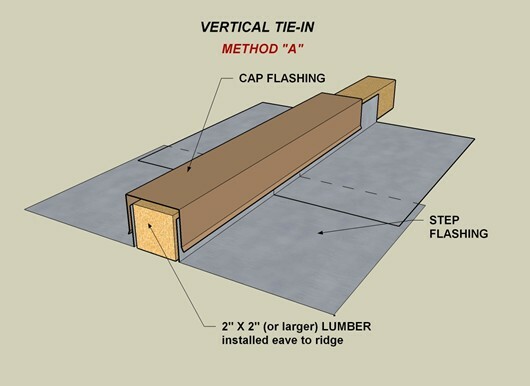 Once the flashing has been installed along both sides of the 2" x 2" piece of lumber install a cap flashing over the top of and down both sides over the step flashing. 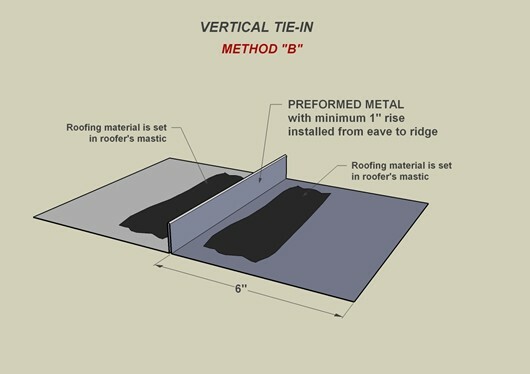 An alternative method , while not as good as Method "A", could be used in some cases when installing new asphalt shingles on the same slope where the existing shingles on part of the roof will be left in place. Check with local Building Department for the okay to use this method. Follow the same procedure as described above, but instead of using a piece of lumber, step and cap flashing, use a special preformed piece of metal. Slide half of it under the edge of the neighbor's existing roofing. Next lift the edge of the neighbor's existing roofing material and seal the roofing material down to the new preformed metal. Install the new roofing material along the other side of the new preformed metal, sealing under each course of shingles.